Our specialists are available as needed to provide on-site technical support and processing assistance including hydraulic, mechanical, pneumatic, electrical systems, controls systems, and downstream equipment. 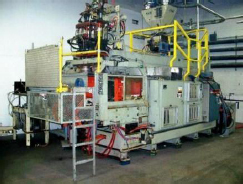 Mid-America's technical support ensures smooth operations through periodic maintenance that will keep your blow molding systems running at peak efficiency. Also, emergency trouble-shooters are available to come to your location 24 hours a day, 7 days a week.